Intelligent street light controller is installed in place of existing feeder pillar. Street light monitoring and Control System starts working with normal power ON. 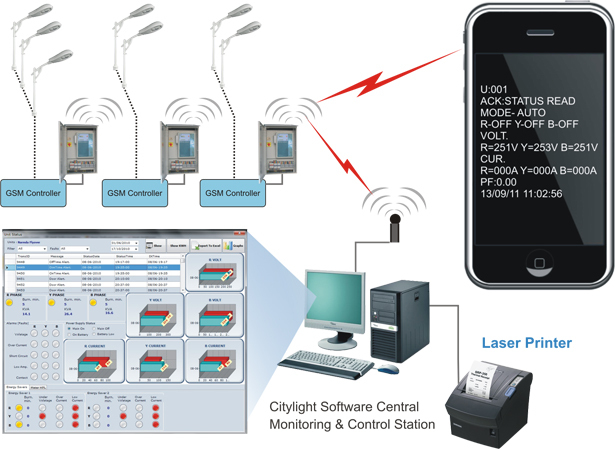 Controller switch on/off the connected street lighting as per astronomical parameter programmed. Controller moves in to energy saving mode as per the programmed parameter and in co-relation with the in – coming power parameter. Controller protects the system by tripping the individual fault phase as per programmed protection parameter settings. Controller can restore the tripped phase by its auto resetting features or by acknowledgement of the alarm. Sample Case study of street lighting operation: explains how energy saved by insu Intelligent street light controller.